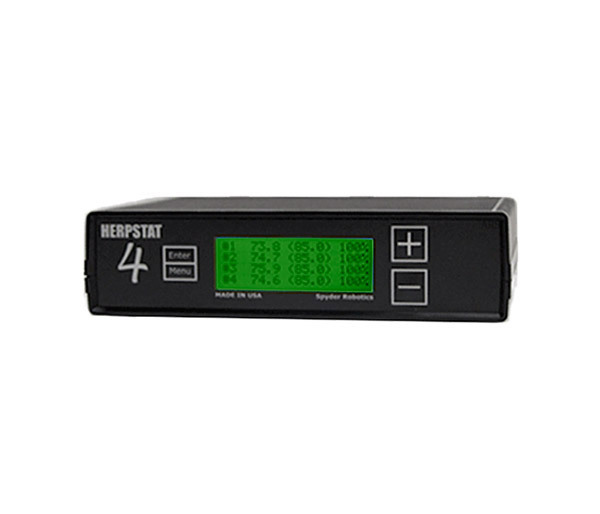 Spyder Robotics Herpstat 4 Thermostat from ARS Caging, Professional Caging for Professional Breeders. Reptile Breeding Systems and Rodent Breeding Systems. Constantly monitors and adjusts amount of heat necessary to maintain a target temperature (Usable range from 40°F to 150°F or 4°C to 65°C). Can also be used in non-proportional (on / off) mode. Outputs 1 & 2 configurable for Heating/Cooling/Lighting. Outputs 3 & 4 can be configured for Heating/Cooling/Humidity/Lighting with simulated sunrise/sunset and moonlight features. Humidity control with timed sessions or regulated with an optional sensor. Safety Relay can disconnect power to all four outlets if the an error exists. Soft startup slowly applies power during initial warm-ups. Sensor Matching allows the user to digitally calibrate the sensor output to match other equipment. Night Drop feature built in with real time clock allows individual night drop settings for each output. Cooling function allows control of basic cooling devices. High / Low temperature tracking helps monitor heating system and enclosure efficiency. Individually selectable High / Low temperature threshold alarms. Display and setting in tenths of a degree. All settings are retained in memory even if power is lost. Power Outage detection / tracking. Temperature can be set / displayed in Fahrenheit or Celsius. Removable sensors allow for easy replacement if necessary. Resettable fuses never require replacement. Each output is fused separately keeping an outage on one output from affecting the other. Internal error detection shuts off heat if sensor fails or is disconnected. Internal temperature sensor monitors heat and controls internal fan. Also shuts down outputs if overheated for safety. Restarts automatically once cooled. Security Passcode option deters vandals. 400 Watt rating for each output (1600 watts total output) sufficient for most incubators, rack systems, enclosures, and vivariums. *Pick up at Show or Warehouse.